I've been working off and on on a port of box2d.js to miniSphere, which would allow a developer working with miniSphere to make more dynamic platformers. If you aren't familiar with box2d, it's a physics engine used in games like Angry Birds, LIMBO, and Happy Wheels. The screenshot shows the stage in "Debug draw" mode, which would be the equivalent of drawing only collision objects in miniSphere. 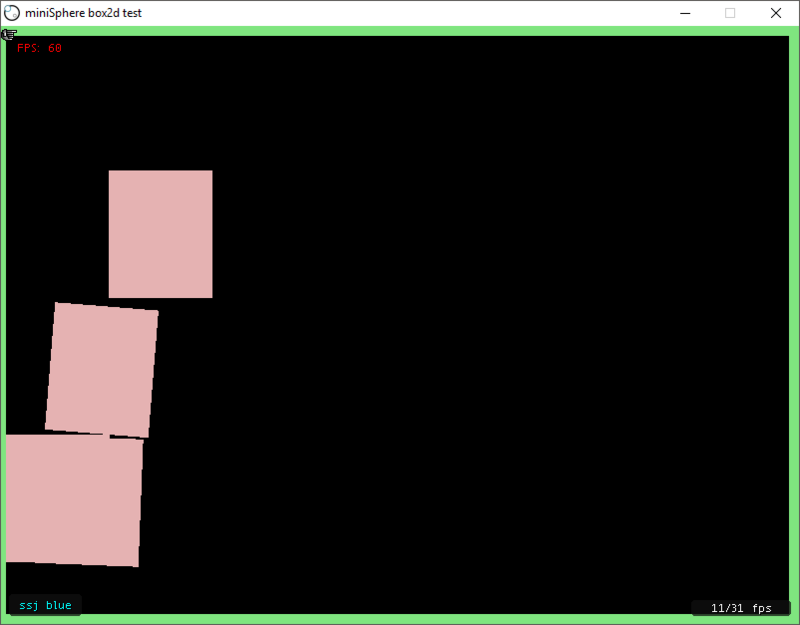 When it's more stable, I would be able to attach a Person object's position and rotation to a box2d object. I wanted to make an animated GIF showing it in action, but OBS studio wouldn't play nicely. This is a somewhat low-priority project compared to the other ones, but I figure you guys might be interested. I'm going to hold off on uploading the code, since it's a bit of a mess right now. As soon as it's at least a little bit more stable, I'll probably upload it to GitHub or something. This is nice! I want to create a platformer in miniSphere eventually, so this would come in mighty useful. Nice! miniSphere 5.0 will make this kind of thing more practical too, thanks to Chakra's blazing-fast performance. I spotted that SSj Blue badge in your screenshot. I imagine you might have leaned on the debugger a lot while developing something like this! That was what I had in mind. I've had an idea for a while now for a game with similar gameplay to Abuse, using this. I figured that was the case. It runs decently with Duktape, but I'm definitely looking forward to ChakraCore. Actually, I was just frustrated with OBS, so I just pressed F5. I do usually make decent use of SSJ, but I haven't used it much with box2d-sphere. @Eggbertx Have you tried it on the 5.0 beta at all? Beta 2 is fairly stable, there might be a glitch here and there but it should run pretty well. For the next beta I should probably have it install in a different location so that people can use 4.8.x and the 5.0 beta side-by-side.